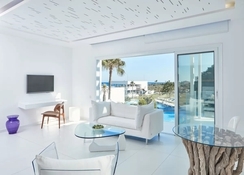 It’s not hard to believe that Atlantica So White Club Resort was designed by one of the world’s leading designers. The design of this luxury resort was inspired by a fresh white island-style providing a refreshing and inspiring place to spend your holiday. Beyond the design, Atlantica So White Club Resort also has exceptional facilities including a spa, floating sun beds in the swimming pool, several restaurants with incredible views over the Mediterranean Sea, live cooking stations and theme nights. Make the most of the coast with offerings including beach volleyball and a variety of watersports. 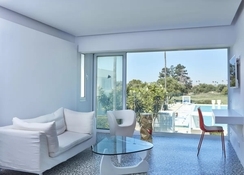 Around the hotel, a short drive will take you into central Ayia Napa where you have access to an array of incredible restaurants and bars, water parks and museums. If you’re looking to party the night away then it’s a case of taking your pick from all the great clubbing spots to be found. 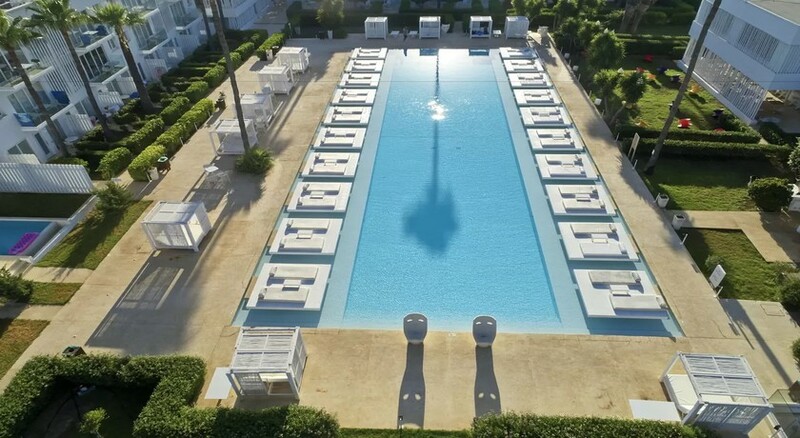 Atlantica So White Club Resort is located just 51km from Larnaca International Airport. Its beachfront location puts Landa Beach within quick and easy reach. Its prime, Nissi Avenue, location means you’re never far from a great place to grab a coffee during the day or a cocktail at night, there are an abundance of restaurants a short drive into central Ayia Napa. If you’ve come to Ayia Napa for the famed nightlife then a quick five-minute drive to central Ayia Napa will enable you to take your pick of great clubbing spots and this is where you’ll find food and retail shopping. A room at Atlantica So White Club Resort provides its guests with an elegant and spacious room to come back night after night. 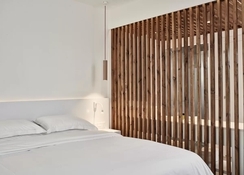 Rooms have been designed by one of the world’s foremost designers and display a fresh, white island concept, which provides rooms with an uplifting and refreshing atmosphere. They are fully furnished with air-conditioning, T.V., tea and coffee facilities and more. Most rooms are double rooms which sleep up to three guests, however, you can step things up with a deluxe double room with your own private pool. Apartments are larger room types and feature a separate living area and fully-equipped kitchenette enabling guests to prepare food in the comfort of their own room. Check out the main restaurant BLU serves breakfast, lunch and dinner as well as having regular theme nights. There are several other restaurants on site providing Italian and Japanese dishes. The Beach Club entertains as well as providing great food with its live cooking stations and al fresco dining experience. More great dining awaits to be had out and about. Try the easily accessible Garden of Eden with its exceptional menu of authentic Mediterranean dishes. A five-minute drive into central Ayia Napa and you’ll come across Japanese, Mexican, great American burgers and much more. Go bar hopping across Ayia Napa with great options from White Rocks to Velvet Lips to The Square Bar, for night on the town. Atlantica So White Club Resort features a lagoon-shaped swimming pool with colour-changing lights, creating an ethereal atmosphere. You can easily laze on the beach working on your tan, however, if you want to have some fun in the sun, then Atlantica So White Club Resort offers its guests beach volleyball as well as a host of watersports, scuba diving and snorkelling. Another way you can cool off and have fun at the same time is at one of the three Ayia Napa Waterparks. With so much rich history it would be a shame to let it pass you by so pop into the National History Museum of Ayia Napa. And if you’ve come for the clubbing scene, you won’t be disappointed with such a large choice of clubs to choose from. Cancellations made more than 30 days prior to check-in date are free from cancellation feed. Brilliant Hotel! I can’t fault it! The quality of the place is amazing, the drinks were exceptional - you have to have the mojito! The pool is brilliant and relaxing and the sea on the resort too! The only let downs were the food but there was variety!